Do You Even Need a Mattress Topper? The answer is yes, if your current mattress is softer or harder than you want, if your mattress is aging, and/or if you are waking up with any soreness or back pain. Mattress toppers provide an additional layer of comfort, suited to your individual needs, and will relieve pressure points that are causing that soreness. Let’s face it: Even if you are a night owl, you do spend at least ¼ of your life sleeping, and you should get the best sleep that you can. Mattress toppers also cost far less than a new mattress. So if the price of a new mattress is beyond your reach right now, that topper can give you more time until you can save enough to make that bigger purchase. By now, most everyone understands that synthetic materials can give off chemical toxins that pollute our homes with toxic off gassing. And the closer you are to that material, the worse it is. You may have a chair that is made of synthetic materials, and you may sit in that chair very occasionally. But when you put your whole body on something for as many as 6 hours or more every day, than you are really exposing yourself to those toxins. And if your mattress is not made of organic materials, then you want a topper that is, to give yourself a layer of protection.Health effects from isocyanate exposure is a concern and the polyurethane products found in homes like foam mattresses, furniture and carpet padding are best know culprits. Isocyanates include compounds classified as potential human carcinogens and have been known to cause cancer in animals. It is discussed in great detail on the Occupational Safety and Health Administration OSHA website under the health and safety topics section. Natural Wool: This topper will give you the “feel” of a pillowtop mattress and will add some softness to a mattress that is too firm. You will also feel more “enveloped” with a wool topper, which can make it seem cozier. These toppers are usually encapsulated in organic cotton. Latex, or natural rubber toppers can increase softness even more but still give additional up lifting support without bottoming out the way other toppers can. While wool toppers have a “fluffy” feel, latex ones are “spongier.” And, these toppers have varied firmness levels depending upon whether you need more or less. If you want to really change the firmness level, you can do so with a latex topper that is 3” as apposed to a 2″ which does not envelope you as much. Wool toppers will not do much to change levels. Again, good latex toppers will be covered in different fabrics like an organic cotton knit casing or a premium organic casing with organic wool and cotton. 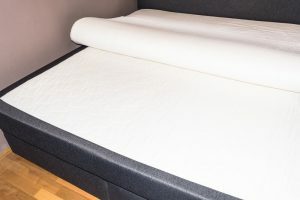 Memory Foam: Warning, do not be fooled, while it may be one of the most popular topper choices both because of its feel and its low cost. Visco elastic and gel foam is often found in most any store including mattress stores, big box stores, and online retailers like Amazon. Memory foam is a type of polyurethane foam and is perhaps one of the most unique feeling and pressure relieving materials to be found and even has been compared to water in terms of its unmatched pressure relief on the body but it is anything but organic since it is a petroleum based material. Do not be fooled by models that use organic cotton covers or have the words organic sewn or printed into the covers. Wool toppers will compress. When this happens, you can use a commercial dryer at a laundromat. And flipping and rotating it often will help too. Natural latex toppers tend not to compress, because rubber will return to its original shape when not in use. Still, rotating is a good idea, especially if yours is thinner (2”). You may not be satisfied if you are buying a mattress topper to “cure” a large dip in your mattress. While the topper may hide it a bit, you will still feel that dip. If you are not sure how to pick a mattress topper here is some basics that can help you get started. Mattress toppers are great problem solvers for some of your sleep problems. Just be certain that the one you buy is all-organic. Your body will thank you.